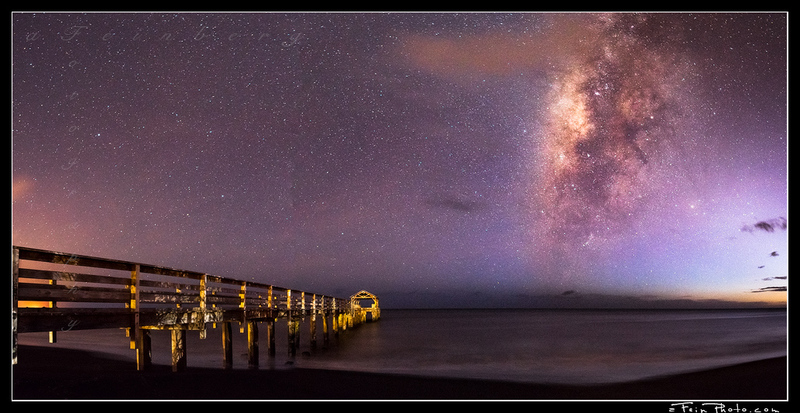 A number of years ago, while traveling back home from a Polihale mission I had stopped over at the Waimea Pier on the west side of Kaua’i. At the time I had only photographed it 1 or 2 times and I generally like to scout and imagine places under different conditions. Doing some calculations I knew I wanted to return at night. Fast forward way longer than I imagined it would take, I had the opprotunity to get out for some photography and headed to a different location. As the sun set over there I realized that I was in the wrong place and remembered the spot I had imagined long ago. Getting there at dusk there were a number of images (another successful pier shot for another time), I was able to make and then waited for the sky to darken enough for the stars and Milky Way to be seen. This spot is extra tricky as it is right at the edge of town so the light polution becomes problematic pretty quickly. As the sky darkened the stars shown through. The camera’s sensitive settings allowing it to pick up the last little bit of twilight glow in the sky giving the scene a surreal look. 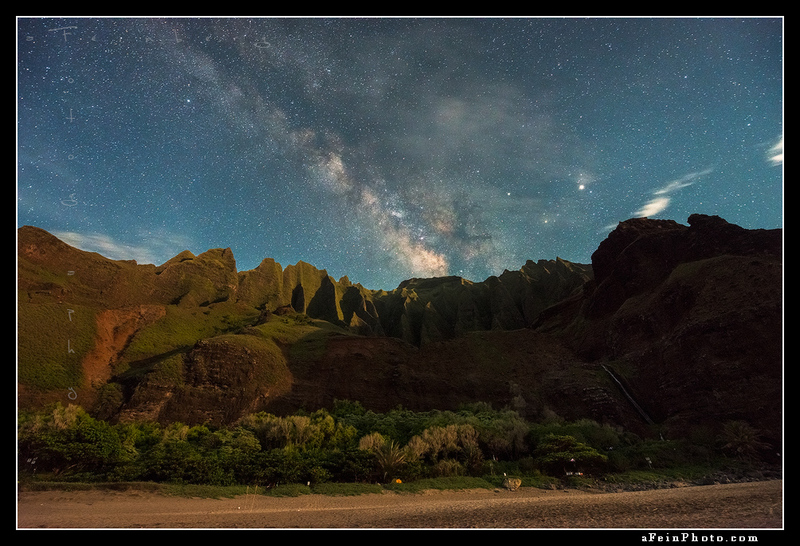 Posted in Image Discussion and tagged kauai, milky way, night, panorama, pier, stars, waimea on November 17, 2017 November 17, 2017 by Aaron Feinberg. It all began on a winter day. Ok, it was a Kauai winter day and we were at a friend’s birthday party dancing. 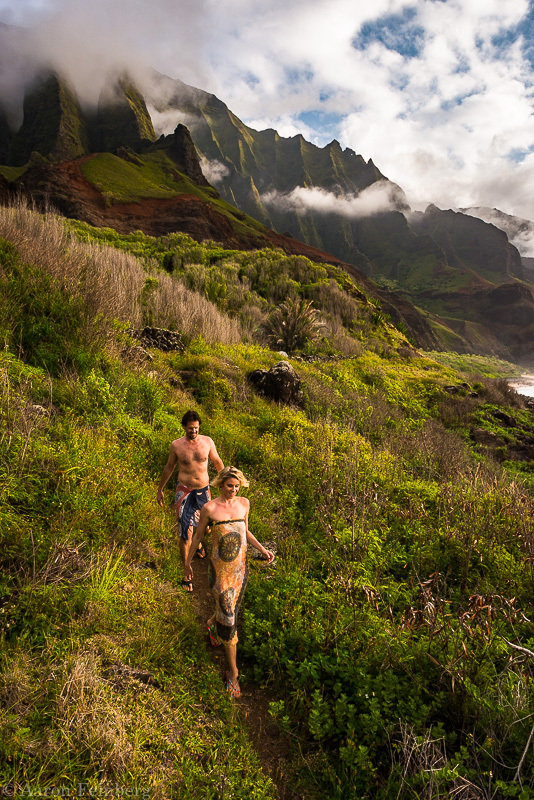 But I was approached by a couple of friends who were getting married in May 2016 and asked if I could join them on this wedding adventure to Kalalau. Unknowing of my schedule I tentatively said yes, because well, Kalalau. I had actually only been to the beach once before about 6 years prior and was in desperate need to get back. Of course I didnt realize how much I would be working at the time but nonetheless, all in good time. We arrived Friday morning and got things set up. And was pretty much in relax mode. Without having a day off in more time than I could remember I was now completely off the grid for 3 full days. 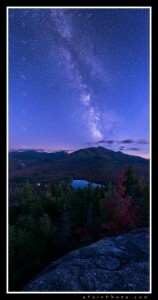 That evening while laying in my tent I decided to check out my photo apps; The Photographer’s Ephemeris and StarWalk. I knew that summer season is better for viewing the Milky Way and had an inkling that it might be rising over the cathedrals. As for the moon and timing, that I needed to figured out. Doing some quick calculations it seemed that my window would be in the middle of the night so I set my alarm for 1am and went to bed. Hearing the phone go off and wanting to stay in bed are all too familiar feelings for most of us. I through on my sarong and grabbed my pack and walked (ok it was a pretty short walk) down to the beach. However this night it was not to be. Clouds. However I was able to see that my hunch was correct. Now to hopefully catch it. 2 more chances. We returned to camp after an amazing event (and photos) and had ourselves a merry little time that evening. This day however instead of going to bed and waking up again I stayed up until my window. As the night progressed and my time came to be our friendly little clouds decided to make an appearance again while I was shooting! Bastards. At least it was an eventful party (clearly I was the last still awake at this point). Off to bed. Strike 2. 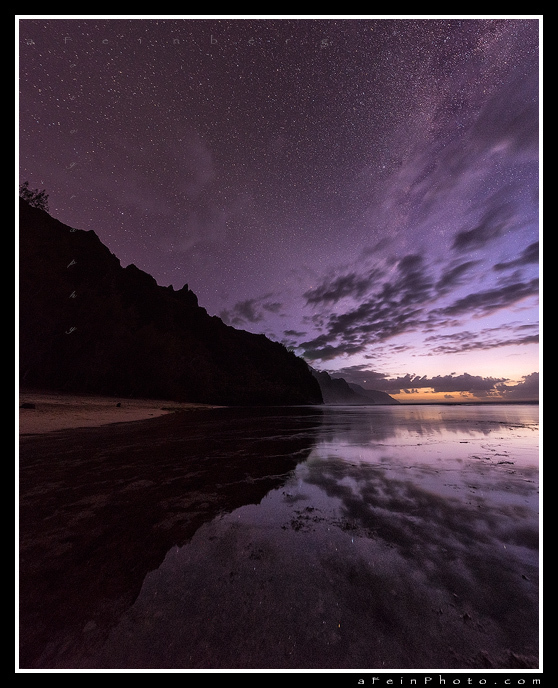 Posted in Image Discussion, Tales From The Road and tagged hawaii, kalalau, kauai, milky way, na pali coast, remote, stars on May 23, 2016 by Aaron Feinberg. It’s amazing how images to come to life. Sometimes they are the work of years of planning coinciding with perfect conditions. This very well may have been one of those photographs….had I actually knew what kind of conditions I was to expect this evening. After spending the afternoon and sunset exploring the southern coast of Maui in the La Perouse area and photographing down there I packed up and started the drive back north. As I made my way down the bumpy road the stars were absolutely blazing. With only a crescent moon hanging in the western sky I was still able to see the landscape but the Milky Way was clearly visible arcing all across the sky. 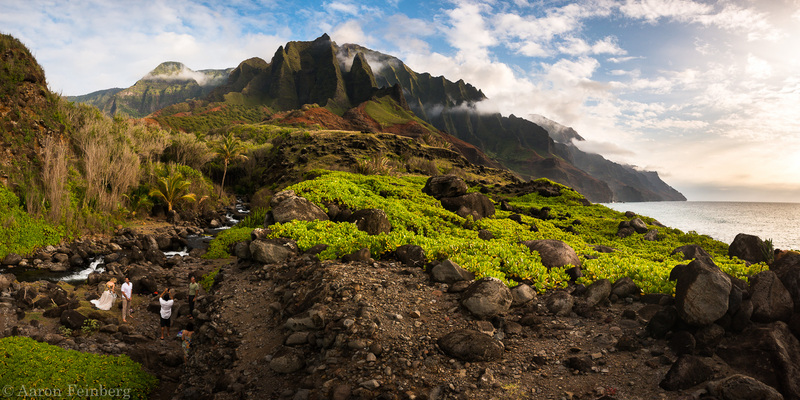 I pulled over to the side of the road and took some images of the scene facing Haleakela. Of course at this point I realized my battery was hanging on to one bar. Uh oh. Change batteries. Dead. Crap. I forgot to charge everything after Burning Man. Back to the first battery and now with every exposure I’m worried about my evening ending early. 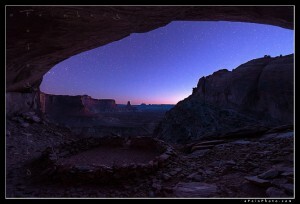 Especially with night time images they take more power as the exposure times are around 25 seconds. I make sure to only take a few shots on the side of the road and continue up. Next stop Secrets beach. Normally Secrets is not so secret. There are weddings almost every day of the week and it’s a great spot to hide out and watch the clouds pass by. However, at night, it is a different story. As I walked down the path and to the shore and set up the waves were pounding pretty good. Lessons learned in the past means keeping my bag well above the high water line. Then approached. At this point I heard voices…what?! I looked around in the darkness. There were houses around so maybe it was there. Then again. Finally I noticed a couple tucked in the back corner of the beach near the wall enjoying the evening as well. Not even alone at night! Of course the obviously difficult thing of shooting stars is that it’s freakin dark out! With the little bit of moonlight I was able to get my composition pretty close and fired off a test shot. Keeping one eye on the ocean to my right I spent the next half an our or so adjusting and trying again. With each shot worried my battery was going to kick out on me. After seeing this one pop up on the back of the camera I was pleasantly surprised. The little but of moonlight was enough to give enough color and definition to the landscape without hiding the blazing Milky Way. Whew. On ward to my next stop where fingers were crossed I could get a few more shots before I had to call it quits. What an awesome night! Posted in Image Discussion and tagged beach, hawaii, maui, milky way, night, seascape, stars on October 3, 2015 by Aaron Feinberg. Ok…maybe not the world. But it sure feels like it when standing on the top of Mauna Kea, the largest mountain in the world (top to bottom) and rising 13,800 ft above the ocean below. I could write for a long time about how I’ve been dreaming for 7 years of skiing this unique place and that finally getting to stand and witness snow in Hawai’i was all too brief but this photograph is more about how freaking cold I was! Knowing to prepare for altitude is not problem. I ski bummed for 3 years in Utah. For this trip I brought many layers…which did the trick…except for the gloves which remained in my bag in the hotel the day of our 6 Day Big Island Workshop‘s trip up to the summit. Not the brightest of ideas. I will say that by the time we left that night temperatures were around 30F with gusts over 40mph (windchill estimates around 13F). Trying to work with a metal tripod, camera buttons and facing in to the wind certainly made for challenging conditions. Which means that I’m was quite excited when I saw the results of this exposure pop up on the back of the LCD screen. The pillar of light you see is called the Zodiacal Light. A phenomenon I saw for the first time in Death Valley last year. The quarter moon did the job of illuminating the rest of the scene. 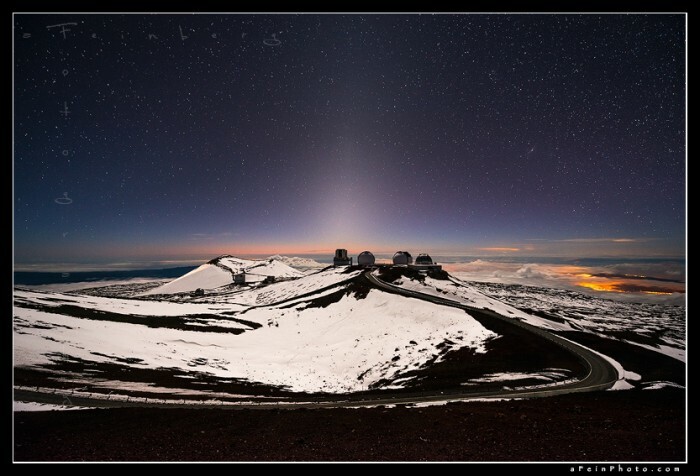 “Phone Home” – Zodiacal light over Mauna Kea and observatories. 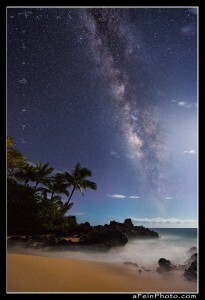 Posted in Image Discussion, Tales From The Road and tagged big island, hawaii, mauna kea, observatory, stars, zodiacal light on March 10, 2014 March 10, 2014 by Aaron Feinberg. Arriving at the trailhead I aimed to get myself up to the top around 45min or so before sunset. Given that there were NO clouds i wasnt in much of a hurry as without them the sky is remarkably boring. But up we go. Making good time, about 20 min to the top, I was glad I brought layers. Not quite the same temperature as Kauai in September! A few other photographers were scattered about taking in the afternoon light while I bounced around the rock figuring out what I would do. Now, my normal train of thought is that if there are no clouds…shoot stars. So the plan was to wait until dark and then hike down with my headlamp (ALWAYS carry at least one in your bag). As darkness fell the other people disappeared as well. Until it was just me. Much more of what I am used to when photographing 🙂 Of course being alone in the dark in the woods lets the mind wander…and I try my best to not be a wuss…but it’s bound to happen. :p Staying warm, 3 layers plus hat plus gloves, etc, sunset faded to twilight which gave way to the heavens above, and my goal for the evening. To my incredible surprise as it got darker I noticed a familiar streak across the sky. My old friend the Milky Way! No way. Directly in front of me right over the peak I was photographing. Well…wasnt going to let this go to waste. Managed to capture a few images as the light balanced out. Back down to the car in about 25 min with that feeling of ‘I hope I didnt screw that up’ it was a great way to start my week. Posted in Image Discussion, Tales From The Road and tagged adirondacks, autumn, heart lake, milky way, stars on October 5, 2013 by Aaron Feinberg. 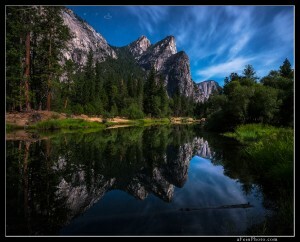 Had the opportunity a couple of weeks ago during one of my signing trips to CA to do a quick run to Yosemite. And by quick I mean I was only in the park for 12hrs. It’s amazing, I’ve been able to be there 3 times in the last 12 months. Something I never even thought might happen. Of course my knowledge of the area is very cursory right now but I consider the time there some of my most productive. This particular evening I finally made the park entrance around 11pm. The moon had rose a couple of hours before and the valley was bathed in awesome, bright moonlight. I drove around a bit to get the feel for this new look and, not wanting anything too crazy of an adventure, decided to pick a location I hadn’t been to before. Of course…sitting outside the gate, at 1130pm, the only thing I could think of was being in the dark, by myself…with bears. I know I know they’re big scared ‘cats’ and run away, but when alone in the woods…eek. So after gathering up some courage and motivation via a friendly reminder I packed up my camera bag, put on my big boy pants and off I went down the trail. Ok…so to get a better picture of the scene imagine just a fair amount of dragging my feet on the ground and taking big heavy steps…to make noise of course. This way I dont startle anything that would want to make me a snack. Spending about an hour making as much as I could of the special light and reflection, the clouds danced across the sky continually making some truly awesome patterns. I finally decided it was time to pack up and get a few hours of sleep in the car before sunrise…so I could come right back here again. Posted in Image Discussion, Tales From The Road and tagged feinberg, moonlight, national park, reflection, stars, yosemite on August 6, 2013 by Aaron Feinberg. When I travel to shoot I need to research an area to get an idea for what to explore perhaps, and find other things along the way of course, but in doing so I try to extremely limit my exposure to other people’s photographs. Never do I want to be at a location and have a shot to replicate. Of course there are very oft photographed areas that I am sure to overlap, however if similarities occur this would most likely be by chance. Which I am ok with as my intention was pure. Arriving at this southern Utah location I knew very little about what to find here, other than bizarre rock formations. Which could be said about much of southern UT 🙂 I took the late afternoon to wander around and explore what the area had to offer. Rock monoliths standing like goblins or some otherworldly creatures. 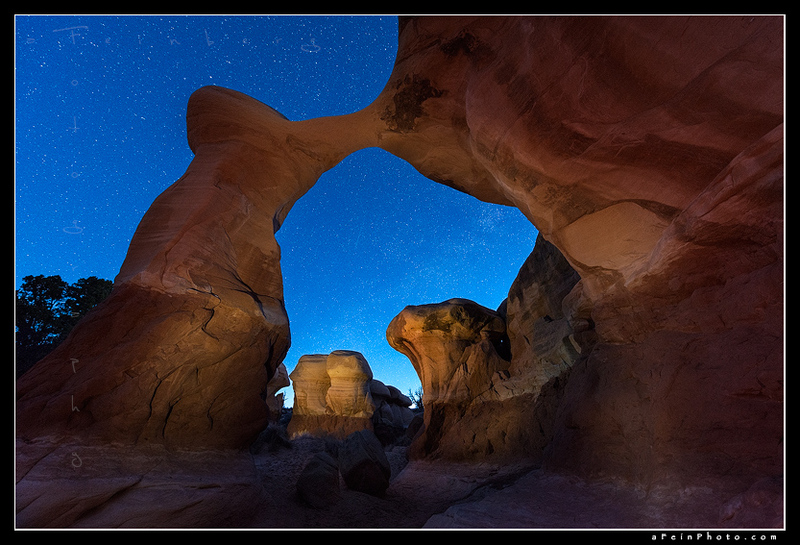 As I came across this arch section the challenge became how would I photograph this place. And I moved on to find other rocks to photograph at sunset. The clearish skies did not lend themselves to good color but my default then becomes stars. Making my way back to this spot I moved back and forth trying to best compose the shapes in front of me and then the waiting game for the night sky to make it’s full appearance. During this course of events I took out my phone and checked the Sky Walk app to see what kind of sky I would be looking at. Fast forwarding to the morning I saw that the Milky Way would actually cross in to the gap! Well that settled it. I was going to set my alarm for 5am and come back here. Knowing it would be almost impossible to compose this shot in the dark, even with my headlamp, I marked the sand where the tripod legs were to be able to place it back at the weeee hours of the morn. Dinner in the car and sleeping in the back of the truck…5am comes. I head out to my spot and set up. There’s the tail end of the Milky Way as expected though not the super vibrant section that was over my right shoulder. I ran around for about 30-45 min light-painting and shooting. Then finally deciding to try and capture other shots while the stars were still blazing (see: There Be Goblins). For whatever reason I decided to head back to the spot of the arch to just capture it one more time. Just in case. 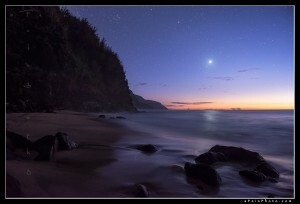 The faint light of dawn already starting to rub out the stars I ran around even faster. Finally settling on the fact the stars were gone to the daylight and off to find other compositions. Posted in Image Discussion, Tales From The Road and tagged escalante, light painting, milky way, stars, utah on May 14, 2013 May 14, 2013 by Aaron Feinberg.